The Nektar Panorama P6 is 61 note USB MIDI controller keyboard with the same deep Reason integration as their acclaimed Panorama P4. Panorama P4 first shipped in June 2012 and has already become a favorite among Reason users who are looking for great integration with hardware and workflow that allows uninterrupted creative freedom. Like the P4, the Panorama P6 features 4 modes that allow the user to switch between Mixer, Instrument and Transport mode and a 4th Internal mode with 20 user presets each configurable for control of external MIDI hardware, ReWired DAW's or other MIDI controllable software. A motorized fader, solo and mute buttons give mix channel control in every mode as does the extended transport buttons with no less than 11 functions a button push away. 16 encoders, 9 faders and 9 LED buttons do most of the controlling with parameters and values displayed on the TFT display. All assignable buttons including the 11 function keys and 12 pads can be setup to send MIDI messages or QWERTY macros, a unique Panorama idea where up to 8 computer keyboard shortcuts can be sent with just one button press. 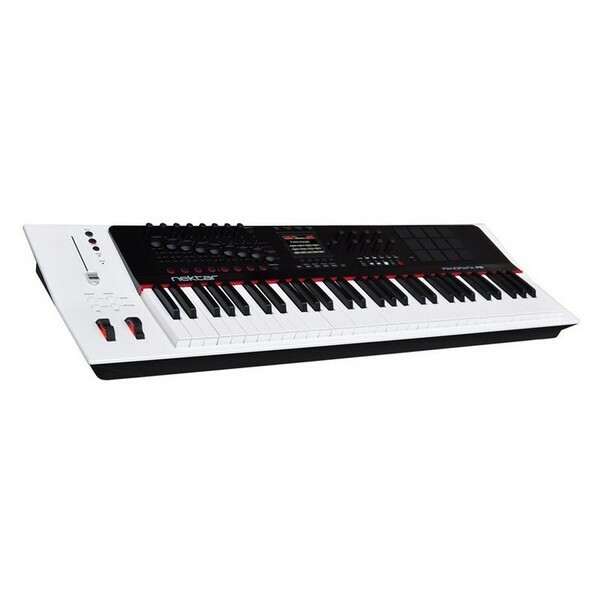 In addition the Panorama P6 features a 61 note velocity sensitive semi-weighted keyboard with after touch, pitch bend, modulation wheel, MIDI out, foot switch and expression pedal sockets. Re-designed Kong, ReDrum and Dr OctoRex interfaces for improved beat creation including colored graphic pads on the TFT display and drum parameters selectable by hitting the corresponding pad. Kong pad 1 and ReDrum channel 1 can now be triggered via the foot switch socket. New mixer channel signal indicators show if a signal is present for any of the 8 channels visible on Panorama's Mixer view. Improved Transport mode with icons showing status for click, Q-record, cycle and pre-count. A button for quantize has also been added along with some re-organization that eliminated the need for another menu level to access some functions. Panorama's "Go to Left marker" button will immediately move playback to the new position. The Looper is a great way to navigate Reason while building up a composition from Panorama but also allows for real-time performances or on the fly experimenting with the organization of Reason songs. New Randomize function. Inspired by Reason's own ability to randomize loop devices such as Matrix and ReDrum, this function now allows the randomization of device parameters that are currently in view on Panorama's display. Whether it's Thor's sequencer, Subtractor's filter or oscillator section or any of the supported Rack Extensions, Panorama will provide alternative inspiration when an extra boost is needed. Formatting of Reason parameter values that are not formatted by the application including EQ and Dynamics parameters. Instant view of F-keys assignments when the F-keys shift button is pressed. Increased pad sensitivity so the pads can be triggered with the lightest of touch. Presets and map changes assignable to any button so it's possible to recall any given preset or map at the push of a button. Options for assigning next or previous are also available with the new default assignment of the Patch- and Patch+ buttons carrying out this function. Secondary encoder curve assignment to be triggered by the PB-buttons. This allows immediate switching between an acceleration curve and a new linear option.